Offering compelling practical and legal reasons why de-identification should be one of the main approaches to protecting patients’ privacy, the Guide to the De-Identification of Personal Health Information outlines a proven, risk-based methodology for the de-identification of sensitive health information. It situates and contextualizes this risk-based methodology and provides a general overview of its steps. Rated the top systems and software engineering scholar worldwide by The Journal of Systems and Software, Dr. El Emam is one of only a handful of individuals worldwide qualified to de-identify personal health information for secondary use under the HIPAA Privacy Rule Statistical Standard. In this book Dr. El Emam explains how we can make health data more accessible―while protecting patients’ privacy and complying with current regulations. 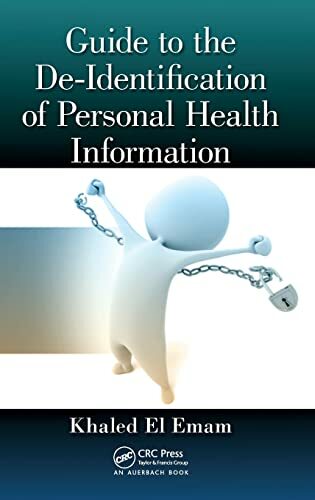 By arguing persuasively for the use of de-identification as a privacy-enhancing tool, and setting out a practical methodology for the use of de-identification techniques and re-identification risk measurement tools, this book provides a valuable and much needed resource for all data custodians who use or disclose personal health information for secondary purposes. Doubly enabling, privacy-enhancing tools like these, that embrace privacy by design, will ensure the continued availability of personal health information for valuable secondary purposes that benefit us all. Dr. El Emam holds the Canada Research Chair in Electronic Health Information at the University of Ottawa and is an Associate Professor in the Faculty of Medicine at the university. In 2003 and 2004, he was ranked as the top systems and software engineering scholar worldwide by The Journal of Systems and Software based on his research on measurement and quality evaluation and improvement. He is a senior scientist at the Children’s Hospital of Eastern Ontario Research Institute and leads the multi-disciplinary Electronic Health Information Laboratory (EHIL) team. Dr. El Emam is one of only a handful of individuals worldwide known to be qualified to de-identify personal health information for secondary use under the HIPAA Privacy Rule Statistical Standard. Khaled is also a world-renowned expert in health information privacy and the head of the Electronic Health Information Laboratory www.ehealthinformation.ca which conducts cutting edge research in this area. He has been de-identifying data since 2004, and has a large following and speaks extensively on this topic. He has edited 2 books and written one already, as well as contributed chapters to a number of others.